There are some castles in Ida Grove, Iowa. 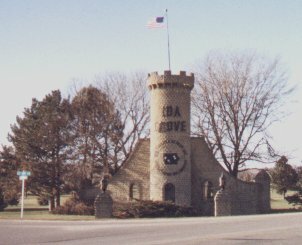 My sister lived in Schleswig, IA and I have seen this Ida Grove "castle". It is really a real estate gimmick. It is a huge subdivision with a medieval theme. It looks really nice but it isn't a real castle at all. I wanted to send this information about the Ida Grove Castles, in Ida Grove, Iowa. I also was told this was a real estate Gimmick also, when My family and I visited Ida Grove. We toured The building and it had a very rich Medieval effect with artifacts and all. But I wanted to send you the story about all of them. The story was obtained from the Ida Grove Courier web site. http://www.idagrovechamber.com/Castles.html Here is the information obtained, I hope that this helps and clears up any misunderstandings. First of all, there was one man largely responsible for the castle structures and that was Byron Godbersen (1925-2003) Byron Godbersen Memorial Page, founder and owner of Midwest Industries in Ida Grove. Midwest manufactures marine and small farm equipment and employs approximately 300 people. Mr. Godbersen liked the castle design and implemented his likes into the buildings built for him by his employees. The privately owned structures are beautiful and help to promote our community. As they are privately owned, few tours are given of the interior of the buildings. Lake LaJune, appropriately named after Byron's wife, LaJune, was constructed in 1969. The eight acre lake, once just an Iowa cornfield, is a private lake owned by Midwest . The primary reason behind the project was to provide Midwest, a leader among marine equipment manufacturers, a local and very impressive location for marine demonstrations and research. The half-scale replica of the HMS Bounty that rests on Lake LaJune was actually constructed by the employees of Midwest with Byron at the helm. The Bounty was constructed during the summer of 1970, and in keeping with the nautical theme, one end of a warehouse was dry docked and construction began. Twelve weeks later, the half scale replica was ready to launch on the lake. As a Christmas gift to Byron and LaJune Godbersen in 1971, the employees of Midwest brought Captain Irving Johnson to Ida Grove. He presented to Byron and LaJune one of the original bronze fittings from the original Bounty. The Bounty was burned by the mutiny crew in Bounty Bay on Pitcarin Island in the Pacific. Captain Johnson recovered the anchor of the original Bounty which is at rest at the chapel on the two-square mile island at Pitcarin. The balance of the pieces are at Mystic Seaport in New London, Connecticut. During the spring of 1971, the stone towered suspension bridge was built to span the Odebolt Creek as it winds its way through Ida Grove and the golf course. And the stone observation tower that forms our city marker and serves as an official welcoming post was completed during this same time. The third civic project for 1971 was less than a thousand yards from the bridge and tower marker that are located on the golf course. We are, of course, referring to the Ida Grove County Clubhouse itself. And to quote a phrase often used by Byron, "It's done about right". In five short months the club house was started and finished and turned over to the club to enjoy. The hangar at the northwest end of the airport was completed to its present form in 1973. Privately owned by Midwest, it houses their corporate plane and a completely restored WACO biplane. The hangar also serves as a meeting area for marine and farm equipment dealer demonstrations and sales presentations along with many civic and political meetings. In 1975, seeing a need for a second newspaper in Ida Grove, the Ida County Courier was begun. The beautiful, "old castle" design graces the downtown skyline, of Ida Grove. Inside, in contrast tot he ancient castle motif exterior, is one of the most modernly equipped weekly newspapers in the U.S. Along about this same time, construction began on what is now Courier Square. This is a mini-mall that includes a health spa beauty salon. A commercial development, which began in 1982, known as Oak Grove Plaza, was formed on the west edge of town. A particular place of interest in this area is the Skate Palace, which, barring none, is the most unique roller skating center in the country. The Skate Palace, is now owned and operated by the American Legion and is used also for wedding receptions, dances, conventions, etc. The Skate Palace sits at the edge of Cobb Memorial Park which, at different times during the year, becomes the "Avenue of Flags". Flags representing veterans who have died are posted around the lake which makes a dramatic backdrop for the hand-fed swans, ducks and Canadian geese which stays in Ida Grove year-round. One of Byron Godbersen's and Midwest's most recent projects was Lake LaJune Estates, a housing development east of Ida Grove. The development was started several years ago with the construction of an entrance arch, streets, several small lakes and Byron's own castle-type home, complete with moat, watch tower and drawbridge. This castle suggested by Katrina Price.